The Subaru started production of 3.0-liter six-cylinder boxer engine the EZ30 in 1999 instead of the EG33 motor. It was designed and intended for installation in heavy vehicles of Subaru brand (SUVs, etc.). The engine was developed entirely from scratch. The cylinder block is made of aluminum. Block height is 202 mm. Cast iron sleeves are inside the block; the thickness of them is 2 mm. The length of connecting rods is 131.5 mm. Compression height of pistons is 30.3 mm. 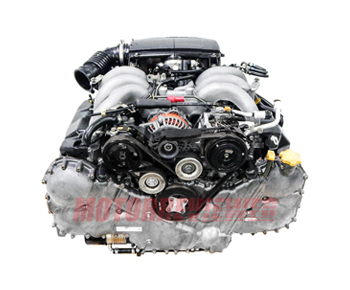 Two aluminum cylinder heads have two overhead camshafts (DOHC) and four valves per cylinder (exhaust/intake valve lift is 10.0/9.5 mm). There are two timing chains; each of them drives camshafts in one head. This engine has aluminum variable geometry intake manifold. In 2003 the manufacturer redesigned this motor and called it EZ30D (EZ30R). The engine got new cylinder heads with variable valve timing system and valve AVCS vale lift AVLS on the intake. The valve lift depends on the engine revs (up to 2000 rpm, 2000-4000 rpm, 4000 rpm and more). The EZ30R engine has the electronic throttle (76 mm diameter), plastic intake manifold, MAF-sensor and new headers. The EZ30 was produced until 2009. It was replaced by the 3.6-liter engine EZ36, which appeared in 2007. 1. Overheating. Check out the condition of radiator and coolant level. It is better to replace the stock radiator with an aluminum high-performance product. 2. Timing chain noises. The problem is in chain tensioner. It requires the replacing chain tensioner and chains entirely. High fuel consumption features the engine. Summarizing, the engine has proven itself as a good and reliable engine. The engine life is about 150,000-180,000 miles (250000-300000 km).